I am on the Now Show on Radio Four tonight at 6:30 (repeated tomorrow at 12.25). I mention Henry Campbell-Bannerman. I wonder if he'll make the edit? Also, some people have asked me about the 'Over 18s only' notice on the website for tickets for my sketch show. Ignore it! All ages are welcome, and there are no swears, and only moderate drinking of alcohol. (During the show, at any rate.) We had a ten year old in last week, and he seemed to survive the experience pretty much unscathed. I'm not sure he will totally have got the sketch based on the black and white Alfred Hitchcock film, but who knows, maybe he did. This post wasn't a total waste of time for us not-living-in-Britain people. Thanks to the wonders of the internet, and the BBC iPlayer, we can listen to the Now Show quite legally, and for free. Not only can we ex-pats hear The Now Show live, we get most of the jokes! But Sandy Toksvig still rules, OK? And Henry Campbell-Bannerman made it! Sandi Toksvig rules OK, but Queen Elizabeth rules UK. Regarding Betty, I predict she will abdicate shortly after the Diamond Jubilee celebrations are over. I mean how many good years does Charlie have left? Sandi's splendid, but it's Laura Shavin who has the undying allegiance of the majority of Texans. Excellent Now Show-ing, sir. You've become very good at last minute rewrites this year. Well done! Thanks for the Puffin. I respectfully submit a picture of the Atlantic puffin -- native to Canada. Hilarious that the BBC seems to think your show is only fit for 18+aged audiences, but Doctor Who is a kids show. Just for the record: I love both. So... for a Swede who might find herself in London July 2 - and apparently is the one person in the world without a credit card to her name - what are the chances of getting a ticket at the door? *hand up* Same question as ny152_sweden, but read "can't afford the internet service fee as well as the ticket price" as the reason. Also, are you doing any more Now Shows this series? Good to see you being asked back a lot! I live in Britain but I first saw this picture in France! Argh! Problem! What do we think judges? Am I allowed to look again since I've already seen it? NY152 and Miss Pear. I think you'll be fine buying on the door, but I can't be certain. Last week, there were plenty of tickets left - this time, I get the sense from Twitter etc more people have booked. My guess is that it still won't sell out before the day, but it's possible. I agree the booking fees are ridiculous, and I wish there was something I could do about it (The theatre picked the ticketing service, not me. And the booking fees don't go to me.) And yes, I'm doing one more Now Show in this series, in about a month. 2fishinatank. No. You may not look at the puffin when you are in Britain, I believe I was quite clear on that. I suppose I cannot stop you remembering the image from when you saw it in France. But if I could, I would. You've got to have rules. Had to add a small f.y.i. for other not-living-in-Britain folk - the Now Show is available on iPlayer here (well, at least for those of us in the US, can't speak for other locations). 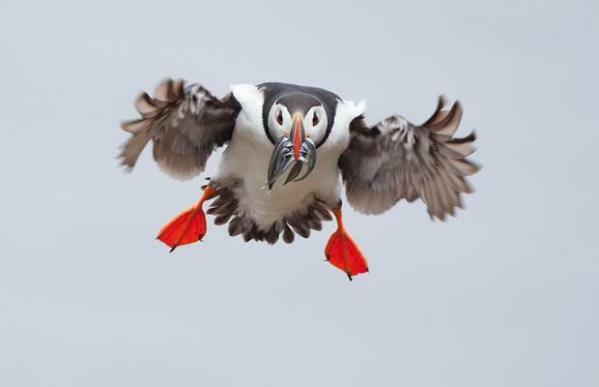 Thank you for the image of the puffin, John. It reminds me of when I used to live in the UK. I never saw any Puffins then either. Busy season coming up for all us aeronauts. Memory serves that it was a fantastic image of a puffin therefore....Jeeves! Book me a ferry ticket! Your rules must be obeyed oh mighty writer god! I pity those in Britain. It is truly a very cute puffin.